1.4 Other offseason developments: "Stand for Stan"
Jaime García flirted with history on May 6, pitching 7​1⁄3 innings of perfect baseball against the Milwaukee Brewers at home, bidding for the first perfect game in Cardinals' history, and the first no-hitter since Bud Smith on September 3, 2001. He ended with a 2-hit, complete-game shutout (his 2nd of 2011), after losing his perfect bid with a walk and a hit in the 8th inning. He later gave up a double in the 9th, the only runner to reach second base. He walked one and struck out eight, and a double-play in the eighth helped preserve his shutout, the third of his career. The Cardinals were a strong 17–12 in May and finished the month 2​1⁄2 games ahead of the Milwaukee Brewers in the NL Central despite numerous injuries to key players. Albert Pujols struggled through a most uncharacteristic slump at the start of the season, going a career-worst 105 at-bats without a home run and finishing May with an unusually low .755 OPS for the first two months. Tony La Russa, suffering from a severe case of shingles, missed six games, with bench coach Joe Pettini serving as acting manager. Late in June the Cardinals cleared two ineffective relief pitchers from the roster. Miguel Batista, who had given up 27 hits and 19 walks in only 29 innings, was let go on June 22. Former closer Ryan Franklin was given his unconditional release on June 29. He was 1–4 with an 8.46 ERA. Opponents battered him for a .367 average, plus 44 hits and nine home runs over 21 games, in only 27​2⁄3 innings. He walked 7 and struck out 17, with a 1.84 WHIP Right-handed pitcher Brandon Dickson's contract was called up to fill the roster spot vacated by Franklin's release. At the beginning of the month the Cardinals were 2​1⁄2 games behind the Brewers in the standings. However, they lost two of three to Milwaukee on the road Aug. 1–3, then did the same at home on Aug. 9–11, giving the Brewers a four-game lead in the NL Central. The team continued to stumble as the Brewers continued to win. 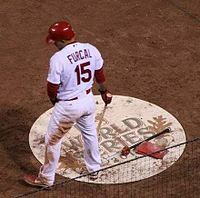 Newly acquired shortstop Furcal hit only .240 for the month. The Cardinals went 2–4 on a six-game road trip to Pittsburgh and Chicago, then came home and were swept in three games by a bad Dodger team. After close of business on August 24, the day the Dodgers completed their sweep, St. Louis had fallen ten games behind Milwaukee in the NL Central standings and 10​1⁄2 games behind the Atlanta Braves (and in third place) in the NL Wild Card standings. Manager Tony La Russa said on the struggles: "I guarantee that the team you have seen the past few weeks is not the team we have, and I believe you will start to see our team tomorrow." Chris Carpenter and other veterans called for a closed, player-only team meeting, which was held the day after the Dodgers series ended. St. Louis' odds of making the playoffs stood at 1.3%. After dropping two of three to the Reds the Cardinals played their last series of the season against Milwaukee September 5–7. St. Louis took two out of three and thus won five of its last six games against the Brewers, but Milwaukee still held a lead of 8​1⁄2 games. The Cardinals got as close as 4​1⁄2 games behind the Brewers later in September but Milwaukee played too well to be caught, clinching the Central Division title on September 23. The same was not true of the wild-card leading Atlanta Braves. 10​1⁄2 games ahead of the Cardinals on August 24, Atlanta went only 6–7 over its next 13 games before coming to St. Louis on September 9 to play a three-game series that would prove to be critical. In the first game, Atlanta led 3–1 going into the bottom of the ninth inning, but a Schumaker single and walks to Furcal and Theriot set up a two-run, two-out Albert Pujols single to tie the game. The Cardinals won on a sacrifice fly by Nick Punto in the bottom of the 10th. 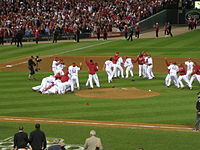 On September 10 St. Louis won by the same 4–3 score when Michael Bourn flied out to right with the tying run on third. On the 11th Yadier Molina hit a three-run double and the Cardinals won 6–3 to complete the sweep. The sweep cut the gap in the wild-card race to 4​1⁄2 games, but St. Louis had only 16 games left to play and its playoff chances were still only 7.7%. The last series of the year for the Cardinals was against the terrible Houston Astros, and Atlanta's was against the powerful Philadelphia Phillies. And since the Redbirds were only one game out of the wild card, the last series was very key. The race between the Cards and Braves and also between Boston and Tampa Bay in the American League began stirring up attention around the country. On October 28, the Cardinals finished off their amazing, end-of-season run, starting after the Aug 24 game when they were 10​1⁄2 games behind for the NL Central Division lead. They defeated the Texas Rangers 4 games to 3, with a 6–2 win in Game 7 of the World Series at their Busch Stadium home in front of 47,399 fans. It was the 36th time a team won the World Series in a Game 7 (or Game 8). The final out was made when David Murphy flew out to left field to give the Cardinals their eleventh world championship. David Freese, a graduate of Lafayette High School in St. Louis, won the MVP award for both the NLCS, and then for the World Series, as well as the Babe Ruth Award. He knocked in a record 21 RBIs in his post-season. Chris Carpenter set a franchise record for most wins (four) in a single postseason. Carpenter, 9–2 overall in his Cardinals postseason career, ran his home postseason mark to 7–0 with a 2.15 ERA. Tony La Russa became only the ninth manager in major-league history to win at least three World Series. ^ "La Russa excited about new deal with Cards: Manager's one-year contract includes mutual option for 2012". Stlouis.cardinals.mlb.com. Retrieved October 29, 2011. ^ "Cardinals finalize 2011 coaching staff". Stlouis.cardinals.mlb.com. October 19, 2010. Retrieved October 29, 2011. ^ "Cards swap with Dodgers for Theriot, sign Tallet". Stlouis.cardinals.mlb.com. Retrieved October 29, 2011. ^ "Cardinals bring Berkman back to NL Central". Stlouis.cardinals.mlb.com. October 22, 2010. Retrieved October 29, 2011. ^ "Cardinals sign Laird to be backup catcher". MLB.com. December 14, 2010. ^ "Cardinals lock up Westbrook with two-year deal: Veteran right-hander stays in St. Louis; rotation seemingly set". Latimesblogs.latimes.com. November 16, 2010. Retrieved October 29, 2011. ^ Bloom, Barry M. (February 15, 2011). "Musial receives high honor from President: "A beloved pillar", Obama says while awarding Medal of Freedom". MLB.com. Retrieved February 16, 2011. ^ "Cardinals Announce 2011 Spring Training Schedule: Team Will Also Play March 29 Exhibition at Springfield, MO". Stlouis.cardinals.mlb.com. December 3, 2010. Retrieved October 29, 2011. ^ "Holliday has appendectomy; timetable uncertain". Stlouis.cardinals.mlb.com. March 31, 2011. Retrieved October 29, 2011. ^ Leach, Matthew (October 4, 2011). "Offense awakens as Cardinals topple Giants". Stlouis.cardinals.mlb.com. Retrieved October 29, 2011. ^ "2011 Franklin game log". Baseball-Reference.com. Retrieved October 29, 2011. ^ Leach, Matthew (April 21, 2011). "Revamped relief corps lifts Cards in Game 2". Stlouis.cardinals.mlb.com. Retrieved October 29, 2011. ^ "Boggs 2011 game log". Baseball-Reference.com. Retrieved October 29, 2011. ^ "Miller 2011 splits". Baseball-Reference.com. Retrieved October 29, 2011. ^ "Freese hit by pitch, breaks left hand". Mlb.mlb.com. Retrieved October 29, 2011. ^ "Cards relievers continue to be evaluated". Stlouis.cardinals.mlb.com. Retrieved October 29, 2011. ^ "Eduardo Sanchez 2011 game logs". Baseball-Reference.com. Retrieved October 29, 2011. ^ "Fernando Salas 2011 game logs". Baseball-Reference.com. Retrieved October 29, 2011. ^ "Quality swings, not homers, matter to Pujols". Stlouis.cardinals.mlb.com. Retrieved October 29, 2011. ^ "Albert Pujols game logs". Baseball-Reference.com. Retrieved October 29, 2011. ^ "La Russa returns for Monday's tilt". Stlouis.cardinals.mlb.com. Retrieved October 29, 2011. ^ "Pujols breaks out, wins NL Player of Week". Stlouis.cardinals.mlb.com. May 31, 2011. Retrieved October 29, 2011. ^ "Colby Rasmus' father is at it again, says it's "fairly obvious" his son needs to be traded". Hardballtalk.nbcsports.com. Retrieved October 29, 2011. ^ "Colby Rasmus game logs". Baseball-Reference.com. Retrieved October 29, 2011. ^ "La Russa: Performance dictates playing time". Stlouis.cardinals.mlb.com. Retrieved October 29, 2011. ^ "McClellan adjusting to return to bullpen". Stlouis.cardinals.mlb.com. Retrieved October 29, 2011. ^ "Ryan Theriot fielding statistics". Baseball-Reference.com. Retrieved October 29, 2011. ^ "Cards agree to deal with veteran lefty Rhodes". mlb.com. Retrieved November 21, 2011. ^ "Standings after games of July 31". Baseball-Reference.com. Retrieved October 29, 2011. ^ "Standings after games of Aug. 11". Baseball-Reference.com. Retrieved October 29, 2011. ^ "Rafael Furcall 2011 splits". Baseball-Reference.com. Retrieved October 29, 2011. ^ "Standings after games of Aug. 24". Baseball-Reference.com. Retrieved October 29, 2011. ^ "for Aug. 24". Coolstandings.com. Retrieved October 29, 2011. ^ "for Sept. 1". Coolstandings.com. Retrieved October 29, 2011. ^ "Grounding into double-play team records". Baseball-almanac.com. Retrieved October 29, 2011. ^ Star, Jon (September 22, 2011). "Deja Crew: Brewers party like it's '82, '08". Milwaukee.brewers.mlb.com. Retrieved October 29, 2011. ^ "Cardinals 4, Braves 3". Baseball-Reference.com. September 9, 2011. Retrieved October 29, 2011. ^ "Cardinals 4, Braves 3". Baseball-Reference.com. September 10, 2011. Retrieved October 29, 2011. ^ "Standings after games of September 11". Baseball-Reference.com. Retrieved October 29, 2011. ^ "for Sept. 11". Coolstandings.com. Retrieved October 29, 2011. ^ "Cardinals 3, Pirates 2". Baseball-Reference.com. September 14, 2011. Retrieved October 29, 2011. ^ "Cardinals 4, Phillies 2". Coolstandings.com. Retrieved October 29, 2011. ^ "Cardinals 4, Phillies 3". Coolstandings.com. Retrieved October 29, 2011. ^ "Marlins 6, Braves 5". Baseball-Reference.com. September 19, 2011. Retrieved October 29, 2011. ^ "for Sept. 19". Coolstandings.com. Retrieved October 29, 2011. ^ "Mets 8, Cardinals 6". Coolstandings.com. Retrieved October 29, 2011. ^ "Cardinals 2, Cubs 1". Baseball-Reference.com. September 24, 2011. Retrieved October 29, 2011. ^ "Standings on Sept. 25". Baseball-Reference.com. Retrieved October 29, 2011. ^ "Cardinals 13, Astros 6". Baseball-Reference.com. September 27, 2011. Retrieved October 29, 2011. ^ "Cardinals 8, Astros 0". Baseball-Reference.com. September 28, 2011. Retrieved October 29, 2011. ^ "Phillies 4, Braves 3". Baseball-Reference.com. September 28, 2011. Retrieved October 29, 2011. ^ "Wild Card Standings | MLB.com: Standings". Mlb.mlb.com. August 24, 2011. Retrieved October 29, 2011. ^ "Braves, Cardinals fight for NL Wild Card – Stats & Info Blog – ESPN". Espn.go.com. September 3, 2005. Retrieved December 13, 2012. ^ Position-by-Position evaluation between the Cardinals and the AL champions Texas Rangers here . ^ Castrovince, Anthony (October 29, 2011). "Never-give-up Cards finish ultimate comeback". MLB.com. ^ "Cardinals Manager Tony La Russa Announces His Retirement « CBS St. Louis". Stlouis.cbslocal.com. October 31, 2011. Retrieved November 4, 2011. ^ "Pujols officially playing the field for first time". MLB.com. Retrieved November 4, 2011. ^ "Cardinals unveil slate of games for 2011: St. Louis to host rival Cubs for nine contests next year". Stlouis.cardinals.mlb.com. September 13, 2010. Retrieved October 29, 2011. ^ "Boxscore:St. Louis vs. Philadelphia – October 1, 2011". MLB.com. October 1, 2011. Retrieved October 1, 2011. ^ "Boxscore:St. Louis vs. Philadelphia – October 2, 2011". MLB.com. October 2, 2011. Retrieved October 2, 2011. ^ "Boxscore:Philadelphia vs. St. Louis – October 4, 2011". MLB.com. October 4, 2011. Retrieved October 4, 2011. ^ "Boxscore:Philadelphia vs. St. Louis – October 5, 2011". MLB.com. October 5, 2011. Retrieved October 5, 2011. ^ "Boxscore:St. Louis vs. Philadelphia – October 7, 2011". MLB.com. October 7, 2011. Retrieved October 7, 2011. ^ "Boxscore:St. Louis vs. Milwaukee – October 9, 2011". MLB.com. October 9, 2011. Retrieved October 9, 2011. ^ "Boxscore:St. Louis vs. Milwaukee – October 10, 2011". MLB.com. October 10, 2011. Retrieved October 10, 2011. ^ "Boxscore:Milwaukee vs. St. Louis – October 12, 2011". MLB.com. October 12, 2011. Retrieved October 12, 2011. ^ "Boxscore:Milwaukee vs. St. Louis – October 13, 2011". MLB.com. October 13, 2011. Retrieved October 13, 2011. ^ "Boxscore:Milwaukee vs. St. Louis – October 14, 2011". MLB.com. October 14, 2011. Retrieved October 14, 2011. ^ "Boxscore:St. Louis vs. Milwaukee – October 16, 2011". MLB.com. October 16, 2011. Retrieved October 16, 2011. ^ Leach, Matthew (October 20, 2011). "Game 1 Recap". St Louis Cardinals. MLB. Retrieved October 29, 2011. ^ "Boxscore:Texas vs. St. Louis – October 19, 2011". MLB.com. October 19, 2011. Retrieved October 19, 2011. ^ Leach, Matthew (October 21, 2011). "Game 2 Recap". St Louis Cardinals. MLB. Retrieved October 29, 2011. ^ "Boxscore:Texas vs. St. Louis – October 20, 2011". MLB.com. October 20, 2011. Retrieved October 20, 2011. ^ Leach, Matthew (October 23, 2011). "Game 3 Recap". St Louis Cardinals. MLB. Retrieved October 29, 2011. ^ "Boxscore:St. Louis vs. Texas – October 22, 2011". MLB.com. October 22, 2011. Retrieved October 22, 2011. ^ Leach, Matthew (October 24, 2011). "Game 4 Recap". St Louis Cardinals. MLB. Retrieved October 29, 2011. ^ "Boxscore:St. Louis vs. Texas – October 23, 2011". MLB.com. October 23, 2011. Retrieved October 23, 2011. ^ Leach, Matthew (October 25, 2011). "Game 5 Recap". St Louis Cardinals. MLB. Retrieved October 29, 2011. ^ "Boxscore:St. Louis vs. Texas – October 24, 2011". MLB.com. October 24, 2011. Retrieved October 24, 2011. ^ "Weather forecast postpones Game 6 of Series: Rangers-Cards to resume play Thursday night at Busch Stadium". MLB.com. October 26, 2011. Retrieved October 26, 2011. ^ Leach, Matthew. "Game 6 Recap". St Louis Cardinals. MLB. Retrieved October 29, 2011. ^ "Boxscore:Texas vs. St. Louis – October 27, 2011". MLB.com. October 27, 2011. Retrieved October 27, 2011. ^ Leach, Matthew. "Game 7 Recap". St Louis Cardinals. MLB. Retrieved October 29, 2011. ^ "Boxscore:Texas vs. St. Louis – October 28, 2011". MLB.com. October 28, 2011. Retrieved October 28, 2011. ^ Goold, Derrick (November 28, 2011). "MLB announces Cardinals' playoff share award". St. Louis Post-Dispatch. Retrieved November 28, 2011. ^ McCarthy, Michael (October 29, 2011). "Cards' Game 7 win most-watched since Red Sox in '04". USA Today. ^ Gorman, Bill (October 28, 2011). "2011 World Series Game 6 Averages 21.1 Million Viewers, Peaks at 25.2 Million". tvbythenumbers.zap2it.com. Retrieved October 29, 2011. ^ "St. Louis Cardinals GAME NOTES ('Bullpen Briefs')" (PDF). MLB.com. September 28, 2011. p. 2. ^ Baseball Info Solutions and Bill James (2011). The Bill James Handbook 2012. ACTA Sports. p. 410.